Profit is soaring right now at SkyWest and Hawaiian Holdings, but both companies could face significant cost inflation in 2017 and beyond. For the most part, airline stocks have struggled to take off during 2016. The Arca Airline Index is barely in positive territory for the year. However, two airline stocks have flown far above the crowd. Shares of SkyWest (NASDAQ:SKYW) have soared roughly 50% in 2016. Meanwhile, Hawaiian Holdings (NASDAQ:HA) stock is sporting a 40% gain. Hawaiian Holdings and SkyWest 2016 stock performance, data by YCharts. 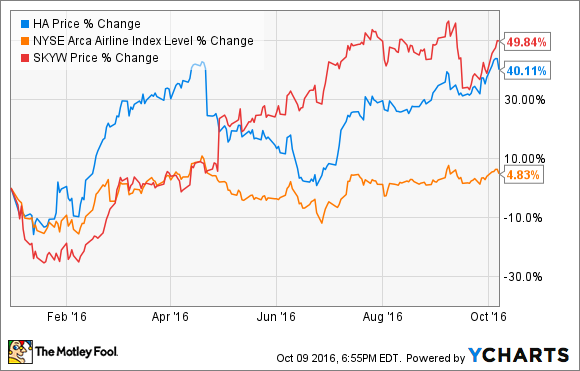 Barring a stunning reversal in the next few months, SkyWest and Hawaiian will be the best-performing airline stocks of 2016 by a wide margin. However, they may struggle to rise further in 2017. How long can SkyWest defy gravity? What makes SkyWest's performance so remarkable is that it occupies a declining segment of the airline industry. Regional airlines like SkyWest were all the rage in the 1990s and 2000s. At that time, the legacy carriers were anxious to outsource as much flying as possible to regional airlines, where pilot pay was much lower. Today, the situation is the opposite. Legacy carriers -- especially Delta Air Lines and United Continental -- are expanding their mainline operations at the expense of regional flights. They are trying to get ahead of a growing pilot shortage at the regional airlines. Low starting pay and rising training costs are the main causes of this shortage. So far, SkyWest has escaped unscathed. In fact, its operating income has soared in the past few years. SkyWest operating income (TTM), data by YCharts. As the largest and most stable regional airline, it is probably a preferred employer for young pilots. Additionally, SkyWest has been able to offset rising pilot costs by exiting unprofitable flying contracts and shrinking its fleet. SkyWest stock trades for roughly 10 times forward earnings, which is on the high side for airline stocks. That already limits its upside. Furthermore, the pilot shortage is likely to get much worse in the next five years, driven by a wave of pilot retirements. This is likely to drive continuing wage inflation at SkyWest, which could eventually pressure its profitability. 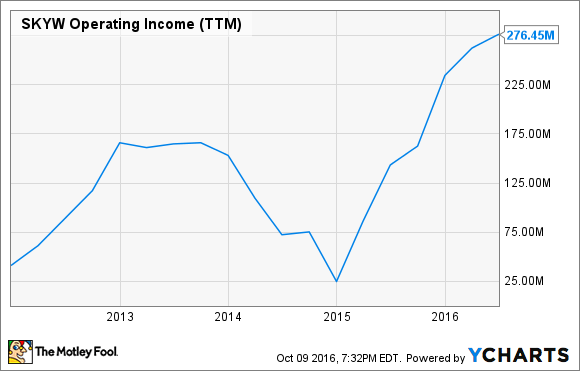 Hawaiian Airlines: Margin pressure on the horizon? Hawaiian Airlines is the only U.S. airline posting unit revenue growth right now. Just last week, the company raised its guidance for Q3. It now estimates that revenue per available seat mile rose 0.5%-1.5% last quarter. Hawaiian's solid unit revenue growth is the main reason for its stellar 2016 stock performance. There's a good chance that Hawaiian's unit revenue growth will accelerate in the next few quarters. The company is starting to roll out its new premium cabin featuring lie-flat seats. It is also expanding the number of extra-legroom seats available. Both of these changes should boost unit revenue. Hawaiian will also continue to benefit from the Japanese yen strengthening against the dollar. Hawaiian Airlines is adding lie-flat seats in its A330 premium cabin. Image source: Hawaiian Airlines. However, investors may be spooked by soaring unit costs next year. To add lie-flat premium seats and more extra-legroom seats on its fleet of A330s, Hawaiian Airlines is removing 16 seats from each plane. That alone will drive significant unit cost growth. Additionally, rising pilot pay is not limited to the regional airline sector. Hawaiian Airlines' pilots are calling for raises of about 50%. The annual cost to the company would be $74 million, which would represent a headwind margin of 3 percentage points. While the pilots will probably settle for somewhat less than their "ask," unit costs will still skyrocket whenever the next pilot contract goes into effect. Lastly, fuel costs have probably bottomed out. As of a week ago, the price of Gulf Coast jet fuel had reached $1.45, after averaging less than $1.30 in July and August. Hawaiian Holdings stock currently trades for about 11 times forward earnings, even though analysts already expect earnings per share to be lower in 2017 than in 2016. I've been bullish about the company for a long time, due to its attractive long-term growth opportunities both in the U.S. and in Asia. However, most of that upside now seems priced into the stock. As a result, I am considering selling my shares in the near future.